Hey, if you missed the land is life event last december and want to check them out, someone kindly posted vids! Kleco Wendy Navaa Smolash for the uploads! Kleco to all who made this event possible and worked so hard to bring us all together! lets share these and amp up the message! 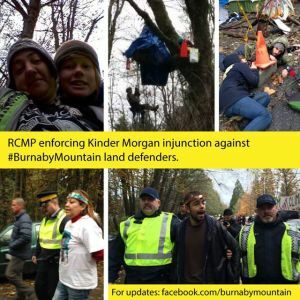 Let the whole of Turtle Island know what is happening here on the west coast of so called “B.C.” These videos are valuable in terms of education on who we are as land defenders, putting a human face on our resistance as the indigenous nations of “B.C.” and they are valuable in showcasing the struggles our individual nations are up against! all of our struggles share the commonality of being based on resource extraction, our genocide, and settler colonialism! this text below is taken directly from the event page and youtube description; short bios on the speakers! Indigenous land defenders from across the interior and north converged in Vancouver Unceded Coast Salish Territories for the Tsilhqot’in Mass Dance Ceremony and Bring the NOIIse: A celebration of 10 years of NOII. This powerful panel that took place the same week, Land Is Life: Indigenous Defenders Speak, is about ongoing frontline struggles by these communities to protect their lands, to assert their nationhood, and to defend their ways of life. These communities have all been asserting and exercising traditional governance, laws, and jurisdiction and have taken up courageous actions to stop mining, oil and/or gas development in their territories. Organized by No One Is Illegal-Vancouver Unceded Coast Salish Territories, Streams of Justice, Council of Canadians and allies. * ANCESTRAL PRIDE: Gwaiina and Xhopakelxhit sovereign Ahoushat / Snuneymuxw. NYM og’s, West Coast warriors seeking to create a culture of resistance by: asserting the jurisdiction and authority we have over our lives and lands. We are in resistance to colonization, industrial land death, mining, logging, pipelines and the illegally occupying military force of so called canada. We also are part of a larger network of decolonizing sovereign nations. * MEL BAZIL: Of both Gitxsan and Wet’suwet’en origin, Mel is involved in his peoples’ history, as a learner and passionate cultural resurgent. He is also a part of the grassroots Lhe Lin Liyin. Combining a healer and a warrior concept, the Lhe Lin Liyin are ‘The Guardians”. Lhe Lin Liyin develop concepts to share among receptive neighboring nations and allies who face common and connected threats of unwanted development. * JACKSON CRICK: Jason is a member of the Tsilhqot’in nation: The Tsilhqot’in (Chilcotin) people have spent three decades defending Fish Lake (Teztan Biny), Nabas and the upper Dasiqox (Taseko) watershed from the threat of Taseko’s massive proposed open-pit gold and copper mine. * FREDA HUSON: spokesperson of the Unist’ot’en clan of the Wet’suwet’en. The Unis’tot’en are taking action to protect their lands from Lions Gate Metals at Tacetsohlhen Bin Yintah, and have also built a cabin and resistance camp in the pathways of approximately seven proposed oil and fracked gas pipelines. * ARTHUR MANUEL: Arthur Manuel is a spokesperson for the Indigenous Network on Economies and Trade and Defenders of the Land network. Manuel has been a leading voice of opposition to the Canadian government’s agenda to “extinguish” Aboriginal and Treaty rights and assimilate Indigenous peoples into the Canadian body politic. * KANAHUS PELKEY: Native Youth Movement Mother and Warrior from the Secwpemc nation. Over the past several decades, Kanahus has been active against – and been arrested – in fighting Sun Peaks Resort, Imperial Metals, 2010 Olympics, and a number of development projects. She has worked with many Indigenous Nations throughout Turtle Island with a clear mission to defend territory and protect clean water, food, and land. * KHELSILEM RIVERS: Khelsilem is a Sḵwx̱wú7mesh-Kwakwa̱ka̱’wakw community organizer. He has worked for a number of years on decolonization and language reclamation supporting the resurgence of Indigenous peoples around principles of justice, freedom, and liberation. 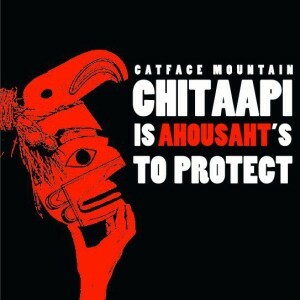 * TOGHESTIY: Likhts’amisyu hereditary chief, Wet’suwet’en nation. Toghestiy has been living in the Unist’ot’en resistance cabin with his family. Toghestiy’s philosophy is based on the ancient Wet’suwet’en philosophy called “Wiggus”, which requires the highest level of understanding, respect, and humility for absolutely everything. There is no price that will ever compromise his responsibility.